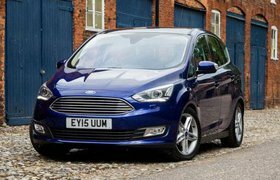 Ford C-Max 1.0 Ecoboost models launched | What Car? 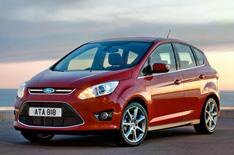 The Ford C-Max and Grand C-Max are now available with Ford's 1.0-litre, three-cylinder Ecoboost engine. A new trim and exterior colour have also been added to both ranges. Ford introduced the 1.0 Ecoboost engine in the Focus; it's also available for the new B-Max MPV, and the updated Fiesta, which goes on sale in November. The five-seat C-Max and seven-seat Grand C-Max will be available with 99bhp and 123bhp versions of the 1.0 Ecoboost engine. In the C-Max both versions average 55.4mpg and emit 117g/km of CO2; the Grand C-Max averages 54.3mpg with emissions of 119g/km. The new engines will be sold alongside the existing 104bhp 1.6-litre four-cylinder petrol engine. Models with this unit cost 500 less than 99bhp 1.0 Ecoboost models, but average economy is cut by 12.6mpg and CO2 emissions increase by 32g/km. Ford has also added a new Titanium X trim to the C-Max and Grand C-Max ranges. Standard equipment includes a panoramic roof, xenon headlamps, part-leather seats, heated front seats, electric driver's seat adjustment and 17-inch alloys. C-Max Titanium X models also get a comfort rear seat system that creates more legroom and headroom for the outer seat passengers by allowing them to slide backwards and inwards, after the central seat is slid back. Ford's Sync system which includes Bluetooth, voice-activation and an emergency assistance system is now standard across both model ranges. A new Driver Assistance Pack is available as an option, costing either 850 or 1050, depending on model. It comprises Active City Stop, lane-departure-warning and lane-keeping systems, traffic sign recognition, a driver alert system, auto high beam and a blind spot information system. The new C-Max and Grand C-Max models are on sale now.